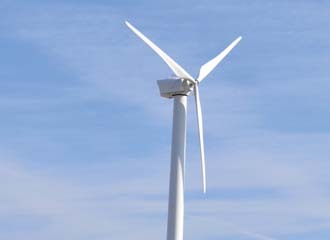 An advanced wind turbine generates electricity in Illinois. The Smart Power Infrastructure Demonstration for Energy Reliability and Security, or SPIDERS, project aims to use base energy sources to power an internal microgrid that would be secure from external cyberattacks. Cybersecurity and a power supply come together on local bases. No man may be an island, but each U.S. military base may become an energy island if a joint project among the Department of Energy, the Department of Homeland Security and the Defense Department comes to fruition. The effort aims to develop a microgrid that would supply a base with internal power independent of any external source that might fail as a result of enemy action. Network security would be a key element of this energy microgrid. Facing the possibility of a cyberattack on the nation’s power grid, military bases must be able to sustain internal power with a degree of immunity from the online tactics employed by cybermarauders. This program also seeks to blend a host of conventional and alternative energy sources into a single entity that would respond seamlessly to internal base power demands. Complicating the endeavor to link these energy sources is the requirement to provide secure network control that could interoperate with the public power grid but still be immune to cyberthreats that menace the larger network. Known as the Smart Power Infrastructure Demonstration for Energy Reliability and Security, or SPIDERS, the project is a Defense Department joint capability technology demonstration (JCTD). It already is underway at Joint Base Pearl Harbor-Hickam, Oahu, Hawaii, and later phases will evaluate progressively sophisticated systems at Fort Collins, Colorado, and Camp Smith, Hawaii. Melanie Johnson, an electrical engineer with the Army Corps of Engineers Construction Engineering Research Laboratory, explains that SPIDERS is designed to develop a template for bringing microgrid technology to military installations in the United States. Its success would have implications for installations outside the United States, particularly in operational settings, she points out. Part of the SPIDERS technical management team, Johnson explains that a key element in SPIDERS is to provide network security for the communications and control systems within that microgrid environment. That security would be vital if a base loses power because of a cyberattack on the local power grid. What sets SPIDERS apart from other microgrid efforts is its emphasis on cybersecurity and network communications. Security is a primary SPIDERS objective, Johnson says, adding that this includes information assurance certification and implementing emerging standards from the National Institute of Standards and Technology (NIST), the North American Electric Reliability Corporation (NERC) and Department of Energy organizations. Adding cybersecurity to the microgrid complicates the picture and requires “a little critical thinking,” Johnson observes. However, SPIDERS is not employing the traditional approach of first developing a control system and then overlaying security. Instead, security will be integrated into the system as it is developed. The result will be a comprehensive security solution that is tailored to the system, she offers. The microgrid control system continually will monitor power quality and conditions in the regional power grid. If it detects instability or significant quality issues, it can alert monitors who would decide to disconnect the base from the external grid. The microgrid would continue to provide power to critical missions. Johnson shares that planners are examining the relationship between the interface with the microgrid control system and the base’s enterprise network. Of particular interest is how that relationship would open the microgrid to vulnerabilities from outside the installation. Issues include the types of communications traffic that would be allowed in and out of the microgrid control system network. According to its guidance, SPIDERS’ primary objectives are to protect task-critical assets from power loss due to cyberattack; integrate renewable and other distributed generational electricity to power task-critical assets in times of emergency; sustain critical operations during prolonged power outages; and manage installation electrical power consumption to reduce petroleum demand and carbon footprint. SPIDERS will exploit existing energy assets such as solar arrays, wind generators and other renewable technologies as well as diesel generators to provide electricity more efficiently than if backup diesel generators alone were used. Renewable energy generators remain online constantly, providing electricity from alternate sources during opportune conditions such as windy or sunny days. Johnson points out, however, that most renewable energy resources trip offline when the main grid crashes. The microgrid allows the renewable power to stay online while maintaining necessary safety measures. The program might tweak the bases’ energy sources by upgrading a legacy generator that lacks the necessary capacity, for example. Otherwise, it will focus on existing assets. Johnson emphasizes that SPIDERS will be energy-source agnostic. Solar heating panels help reduce power generation demands for a building. Alternative energy sources are a key to SPIDERS being able to deliver energy autonomy in its internal microgrid. The SPIDERS effort comprises three phases, which Johnson describes as “crawl, walk, run.” The crawl phase is taking place at Joint Base Pearl Harbor-Hickam. A single circuit there serves a wastewater treatment plant, and this circuit includes a solar array, several wind turbines and a hydrogen refueling station. SPIDERS is incorporating those renewable assets along with a pair of diesel generators into the microgrid. This effort is crafting its final designs with an eye toward the next phase. The walk phase will take place at Fort Carson, Colorado. Several diesel generators are being incorporated into a microgrid that includes a 2-megawatt solar array and hybrid electric vehicles. Johnson explains that these electric vehicles can supply power to the grid as well as draw from it. This more complex microgrid will serve critical assets, and it will exceed information assurance certification requirements by meeting emerging standards such as smart grid cybersecurity and industrial control systems. Final demonstrations are scheduled to take place in March 2013. Next, SPIDERS will run at Camp Smith, where the entire installation will be placed on the microgrid. This microgrid will feature a large number of renewable energy resources as well as traditional fossil-fuel generators. Johnson describes the cybersecurity solution for this microgrid as “extremely comprehensive and complete.” While this effort will begin as the Camp Smith phase matures, its final demonstrations would take place in 2014. As a JCTD, SPIDERS includes a formal transition phase that allows participants to apply lessons learned from each stage to other parts of the Defense Department as well as to the commercial sector. Findings, design methodologies and other types of expertise are being transferred to other organizations, Johnson states. The Joint Base Pearl Harbor-Hickam phase already has achieved several goals as it moves toward the next step. Dr. George Ka’iliwai III is the director, resources and assessment (J-8), U.S. Pacific Command (PACOM). The SPIDERS JCTD effort in Hawaii is being run out of PACOM’s Joint Innovation and Experimentation Division in his office. Ka’iliwai describes SPIDERS progress as maturing in two areas. One area is in fuels, in which the effort is helping enable greater use of nontraditional electricity generation. The second area involves installations. Both efforts are proceeding well, he says, adding that the three-year effort aims to demonstrate grid cybersecurity as well as smart grid technologies. In Hawaii, engineers are working with feed stock providers and biorefiners to convert feedstock into a replacement for JP-8, JP-5 and F-76 fuels. These efforts will be fed into SPIDERS. Experts with SPIDERS also are working with Defense Logistics Agency Energy on related efforts. Most of the experiments on the cyber side have generated positive results, Ka’iliwai reports. He adds that these efforts largely have gone better than expected. Some of the challenges that have arisen involved roles, responsibilities and authorities rather than technologies. “Cyber is a very new domain, and we’re still learning and working our way through many of those issues right now,” he says. At this juncture, the cyberwork within SPIDERS is fairly minimal, Ka’iliwai allows. The Fort Carson version will see a considerable increase in cyberwork, and engineers in Hawaii already are laying the groundwork for that. Their work includes cyber applied to common operating pictures on classified networks, and lessons learned will be applied to supervisory control and data acquisition (SCADA) network protection. The SPIDERS cyber component will be a vital element, as it must ensure protection that resides on the network. Smart grids tend to rely heavily on wireless technology, so security will play a significant role in the network’s operation. Ka’iliwai emphasizes that SPIDERS still is evaluating to what extent wireless communication will be required for smart microgrids on military installations. Overall, the technology readiness levels of individual SPIDERS components are relatively high and close to being fieldable capabilities, Ka’iliwai says. The challenge is in trying to integrate them into the smart grid. Johnson says that the system-of-systems integration of SPIDERS is its biggest challenge. The presence of power systems and control systems is complicated by adding the network communications and cybersecurity requirements. Bringing together all of the necessary expertise is a key to success, especially because incorporating any element into the architecture affects the others. Large power grids provide stability as a characteristic of their design and size. That stability does not automatically apply for a microgrid, Johnson points out. Microgrid stability must be ensured by a control system that balances power coming from multiple sources. SPIDERS is implementing control over nontraditional systems such as electrical loads, she continues. The system must manage both power supply and the load on the microgrid. Optimizing controls will govern the power provided by generators according to generator and technology efficiency—whether solar panels should be providing a large portion of the power, or whether a windy day can increase dependence on windmills, for example. To maintain stability from moment to moment, SPIDERS employs an approach known as droop control. Too much load on a system causes the frequency to droop below its operating frequency of 60 hertz, and too much generation will cause the frequency to rise above 60 hertz. Droop control monitors the frequency to provide insight into the microgrid’s generation and load so that the system can maintain an appropriate balance. Johnson offers that successful SPIDERS development could be exploited by any physical campus or community that seeks to enhance its energy security. A site that experiences power quality issues from a larger grid in particular could find a SPIDERS approach useful, especially if it employs a range of different power generation assets. Ka’iliwai notes that the Pacific Northwest National Laboratory in Idaho is helping transition SPIDERS technologies into the commercial sector.